The 1945 Toscanini concert raised money for shoes for these orphans, gathered around his picture with their new footwear. CMS.003. The Center for Migration Studies of New York (CMS) maintains unique archive collections that document US immigration history and policy from the mid-19th century to the present. CMS’s From the CMS Archive series attempts to apply archive records, documents, photographs and other materials to current US and global immigration policy issues. For more information on this post or to request access to the CMS Archive, please contact archives@cmsny.org. After World War II, Italy found itself on the front of a new struggle, to resettle civilians whose lives had been disrupted by war. Italy’s experience contributed to an understanding of the role migration could play in promoting both individual and national economic security, and the security not only of a struggling nation that could not employ its own people but of a developed nation in need of new workers and new markets. As Allied troops fought their way across the island of Sicily and then up the Italian peninsula, behind them came organizations whose workers sanitized the water supply, distributed food and clothing, provided medical care, sheltered the homeless, and restarted local economies. One such organization was American Relief for Italy (ARI). 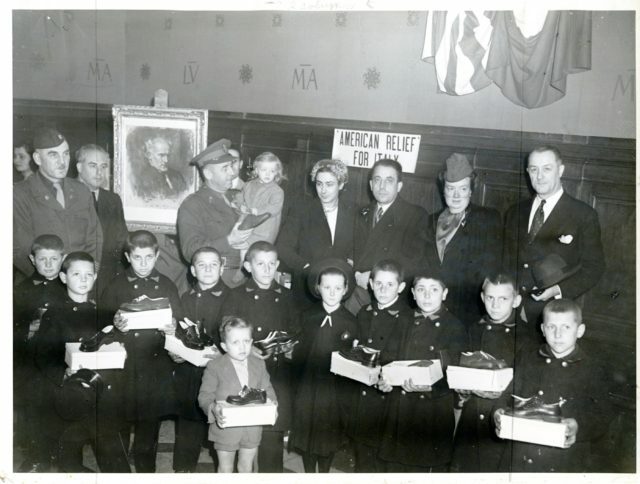 ARI was supported by a network of donors, many of them Italian Americans who gave money, food and clothing through their local religious and social organizations. Industrialist and diplomat Myron C. Taylor had helped found ARI in 1944 and served as its initial president. However, Taylor soon had to leave this post, as he was serving as President Franklin Roosevelt’s personal envoy to Pope Pius XII. 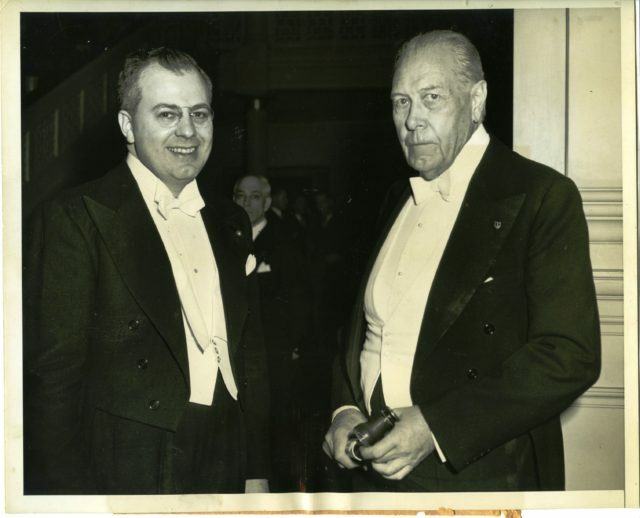 Judge Juvenal Machisio and Myron C. Taylor, at an American Relief for Italy benefit at the Metropolitan Opera. CMS.004. Taylor’s successor was Juvenal Marchisio. The son of immigrants, Marchisio was born in Brooklyn, educated at Saint John’s University in Queens and Fordham in the Bronx, and from 1937 to his retirement in 1970, served as a judge in Brooklyn’s family court. In 1943 Judge Marchisio took a leave of absence from the bench to become Executive Chairman and then President of ARI. He formed relationships with numerous agencies and attracted donations from them. He arranged for the transportation of these donations to Italy, for their temporary storage in major cities, and for their distribution, mostly in small towns in the mountains of Southern Italy, to people affected by the war. 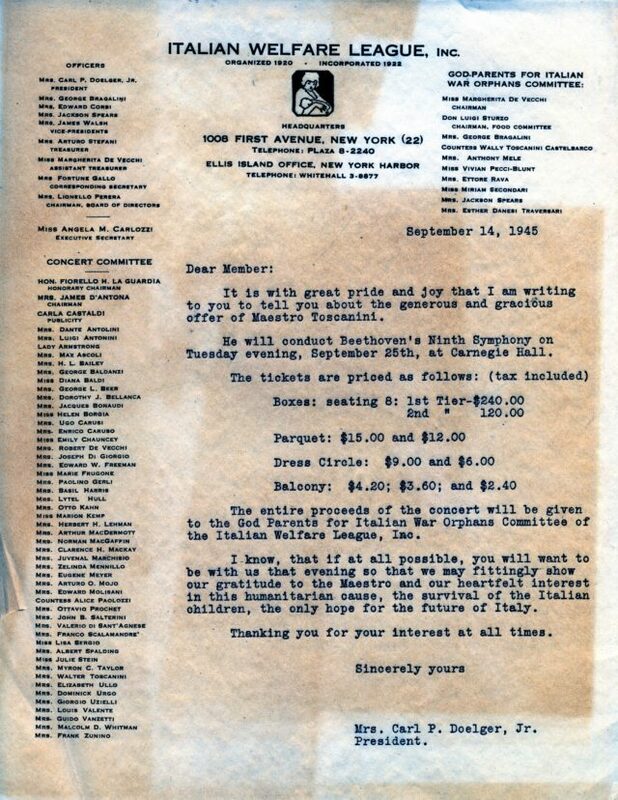 Maestro Arturo Toscanini’s concert for the benefit of the Italian Welfare League was the most spectacular of the many fundraising events that supported the efforts of American Relief for Italy. CMS.003. Particular efforts were made for the care of children. Children who had lost their parents or become separated from them were a common sight even in little villages. They sought shelter wherever they could access it, and scrounged for food, clothing and even cigarettes, which helped cut their hunger. Religious orders and dioceses found space to gather separate groups of preschoolers and school-age boys and girls, outfit them with clothes and shoes, feed them, tend to their medical needs, resume their educations, and provide some training in common job skills. Judge Marchisio was involved in an effort to create an Italian “Boys Town,” modeled after the one in Omaha. Once adults were re-settled and children educated, then what? Even the reconstruction of Italy after World War II could not employ all those who needed work. Historically, few Italians owned enough land for more than subsistence farming and few could find work nearby. Migration allowed Italians to move where work was plentiful, sending home remittances that paid real estate taxes and met other cash expenses. The United States, two weeks away by steamship, with its plentiful supply of diverse opportunities, was a favorite destination. After World War I, the United States began to restrict immigration, and, particularly, to limit migration from outside of northwestern Europe. From 1922 to 1945 Mussolini’s dictatorship, worldwide economic depression, and war masked the effect of US immigration law. After World War II, the problems with the law became apparent. Italian workers found few employment opportunities in Italy and limited ability to expand their search abroad. This reduced their own families’ abilities to recover from the war, rebuild their homes, and participate in the expansion of the post-war consumer market. Ironically, restraining American immigration restrained American industry, undermining the Italian market for all the consumer goods the American economy produced in the years after the war. Who was in a position to reform immigration? It made sense to involve Italian Americans. They were personally affected; it was their relatives who needed help. They were also affected as Americans; they understood how limiting migration limited development in Italy which in turn limited American economic development. And they were citizens who understood how to effect change. The first person on record to understand the importance of Italian Americans in the development of Italy was Monsignor Luigi Ligutti. Himself born in Italy, Monsignor Ligutti had come to the United States while studying for the priesthood and had been ordained for service in the rural diocese of Des Moines, Iowa. Pastoral concern for his parishioners led to his involvement in the National Catholic Rural Life Conference and the New Deal, which in turn led to a post-war appointment as Vatican Observer at the UN Food and Agricultural Organization. 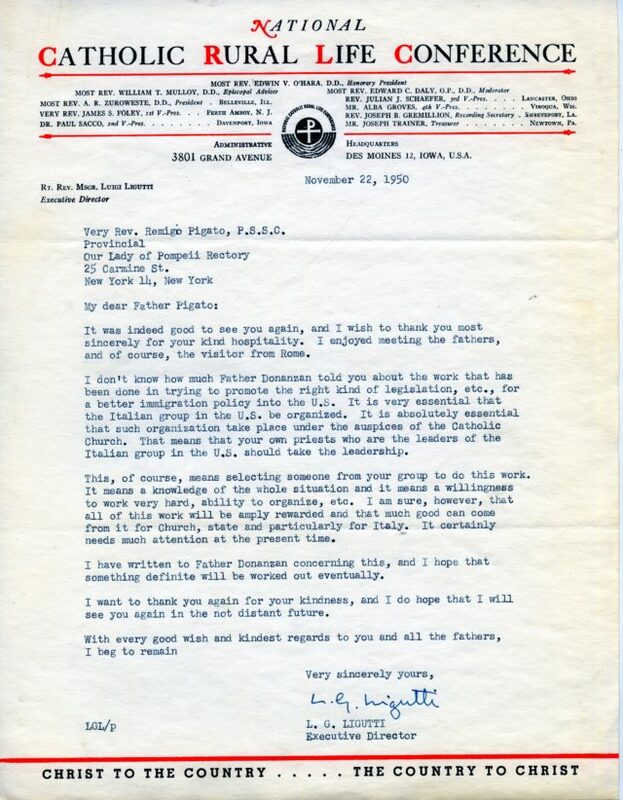 Monsignor Luigi Ligutti’s 1950 letter suggestion Italian Americans organize to press for immigration reform. CMS.001A. Over the next two years, Monsignor Ligutti’s sense of urgency increased. Senator Patrick McCarran, a Democrat from Nevada, undertook to codify US immigration law. This was a golden opportunity to eliminate the restrictions that had limited immigration since the 1920s, and McCarran deliberately did not take it. President Harry Truman fought back against his fellow Democrat, vetoing McCarren’s immigration law. When the 1952 Immigration and Nationality Act passed over his veto, Truman escalated his fight against restrictive immigration by impaneling a commission to study US immigration law even though Congress had supposedly just “reformed” it. Among those who appeared before the panel was Monsignor Ligutti. The monsignor addressed two arguments underlying the 1952 McCarran-Walter Immigration and Nationality Act. Ligutti found the privileging of northwestern Europeans impractical, un-Christian, undemocratic, and a hindrance to forming alliances with other nations. With his experience in the economics of agriculture, Monsignor Ligutti was able to refute a second argument for a limit on the numbers of immigrants, the fear that high immigration would lead to high unemployment rates. That might be true, he conceded, in a less developed “pie” economy, with only so many natural resources and only so much for each person. But in the US economy, people developed the resources, actually producing more of them, and creating more jobs in the process: think of a farmer who did not just gather wheat, but ploughed the ground, fertilized it, planted the seeds and then not only harvested the crop but shipped it to be processed into flour and then sold to many other consumers. “A job creates a job,” he explained. Monsignor Ligutti not only protested the McCarran-Walter Act, he found other people to lead a movement against it. Ligutti and Judge Marchisio, who shared an interest in postwar Italy, found themselves in agreement on the importance of migration to the continued development of Italy and the United States. Sometime in the early 1950s Monsignor Ligutti introduced Judge Marchisio to the Scalabrini Fathers. The result was the formation, in 1952, of the American Committee on Italian Migration (ACIM), with Judge Marchisio serving as its National President; a young Scalabrini Father, Caesar Donanzan, as its Executive Secretary; and Miss Yolanda Coda as the principal office staff. Together these three raised funds among Italian Americans to assist with the paperwork of Italians who were able to migrate and to lobby the US government for improvements in immigration law. The lobbying took several forms. ACIM had a monthly newsletter, The Dispatch. Each issue contained instructions for writing one’s Congressional representative about pending immigration legislation. ACIM also organized “symposia,” held each year alternating between Rome (which served as a fundraising trip as well as a chance to hear about the impact of immigration on Italy) and in Washington DC. When in Washington, ACIM members paid personal visits to Congress and to the White House urging immigration reform. Their work paid off. ACIM was one of several civic organizations that shaped the development of the 1965 Immigration and Nationality Act, which removed the discriminatory restrictions against persons from particular nations. Judge Marchisio and Father Donanzan made individual efforts that have not yet been fully explored. Judge Marchisio worked for ACIM for his expenses only, and so kept a “diary” that recorded not only the expenses, but his activities. 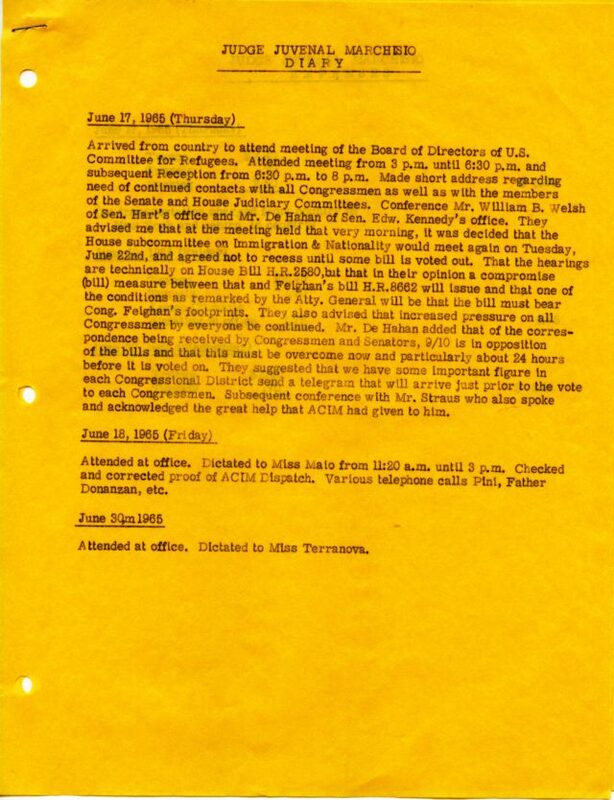 His diary for 1965 consists of a folder full of typed carbon copies of reports of meetings and phone calls, indicating that he spoke frequently with the White House, sometimes with President Johnson himself, and also with Vice-President Hubert Humphrey, with Senator Edward M. Kennedy, who was carrying on his brother John F. Kennedy’s interest in immigration, with Senator Phil Hart and Representative Emanuel Celler, the sponsors of an immigration reform bill, and with Representative Michael Feighan (D-Ohio), who was a significant supporter. These people were among the earliest to perceive that the continued development of even as powerful a country as the United States rested upon the development of other countries, and on the role of migration in ensuring that development was measured not in statistics alone but in the lives of individuals and families. Page from Judge Juvenal Marchisio’s 1965 records indicating ACIM’s work on the 1965 immigration bill.